Here's an example of just how far off someone's (in this case, mine) interpretation of a song can be from its real meaning. I'm listening to the new CD by Retsin, the duo of Tara Jane O'Neil and Cynthia Nelson, who will be adorning the Sokol Underground stage May 19 with their friend, Karla Schickele (Ida, Beekeeper) performing as K. and Omaha one-man-band songster Fizzle Like a Flood. 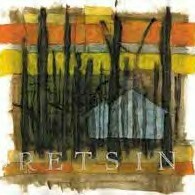 Retsin's CD, just out on Carrot Top Records, is called Cabin in the Woods and is 15 down-home, quiet acoustic gems that interplay guitar, banjo and O'Neil and Nelson's sweet, serene harmonies. Think low-key Red House Painters meets Low with a hint of twanging bluegrass sung by clear-voiced women and you start to get the picture. I envision two young girls in night dresses, sitting crouched with arms around their knees in the gloomy dirt-floored corner of a tin-roofed shack somewhere in the mountains, rain pouring down, rattling like the lid on a pot boiling over, orange water dripping rich with rust from the beaten roof, scared and tired and wishing the rain would just stop. The heavy boots? Why that must be thunder, crashing around them as their world falls apart. Oh, why didn't they stay in Alabama! Why did they throw it all away for a new life up north? This is surely the elegy of a pioneer family or a recently freed slave who left behind all she knew only to be trapped in a rural hell with nothing but rain and dust and her own self doubts. I explain my interpretation to Nelson during our interview conducted hours before she and O'Neil took the main stage for a headline performance at The Knitting Factory in New York City. I gushed at "Land of the Lost," my favorite song from a collection seemingly filled with rich, georgic flavored ballads, all written, performed and thoroughly influenced by a summer the two spent in a cabin in upstate New York. "Oh, that one wasn't recorded in the cabin," Nelson said, instantly deflating me. "We recorded it in our apartment in New York City, before we left. That song is about one of the situations that inspired us to leave -- we were in our apartment when they were renovating the apartment upstairs. All that noise and dust, it was awful." So much for the pre-Civil War escaped indentured servant theory. "Most people tend to put their own vision on our music," she says, consoling me. "It was the kind of place where you could find a snake inside your newspaper or where a mouse would eat through a phone line, and at night it was so quiet outside and so dark. " "Most people tend to put their own vision on our music." 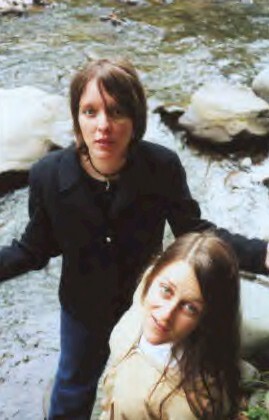 O'Neil and Nelson have been performing as Retsin since 1994, releasing four albums of self-described quirky, emotional pop songs. For years they toured as a four-piece, "The Retsin Good Times Band." But after being unable to find the right musicians to fill out their sound, they shifted and simplified, touring the United States with two acoustic guitars and their two voices for two years. On the new CD, they add banjo, flute, accordion, violin and Old English ballad sounds in an effort to create a hazy, wooded, pastoral world. Guest performers include Ida Pearle and Liz Mitchell (who perform together as Ida). O'Neil used home recording techniques to capture the acoustic instruments bouncing off the old cabin's A-frame wood ceiling. "We used as much of the country as we could, listening to old-time folk music and living in the woods, observing animals," Nelson said. "We weren't super-isolated. The cabin was sort of like a small house with a nice deck. It was more about the environment than the actual structure. It had the right flavor. It was the kind of place where you could find a snake inside your newspaper or where a mouse would eat through a phone line, and at night it was so quiet outside and so dark." The escape from New York was provoked by the duo getting kicked out of their apartment. "We were burned out by living in the city," she said. "It was cramped. We wanted a little more beauty and space. We were asking around and found the summer cabin available for six months, which just happened to be the time we planned on recording. If they hadn't gotten the cabin, the CD would have been recorded in a New York City apartment (presumably called Apartment in the City?) and would have sounded a lot different, she said. "I can hear that cabin and feel the woods and the situation we were living in every time I play it." With the cabin now long behind them, Nelson said the couple was offered a free house to stay in -- an empty, two-room beige condo that will be used mostly as a storage facility in the coming months. "We plan on doing a lot of touring this year," she said. "This tour will last seven weeks, and we'll be busy with other projects. Tara has been recording a solo record and I've been writing a bunch of poems, trying to make a new book." Nelson has written three books of poetry, including 1998's "The Kentucky Rules," all of which have been published by Soft Skull Press, a publishing house based in New York City's Lower East Side, known for printing "fearless, progressive, punk-rock/hip-hop literature." Published in The Omaha Weekly May 16, 2001. Copyright � 2001 Tim McMahan. All rights reserved.